Hookbill The Koopa's Castle is the final level in World 4 of Super Mario World 2: Yoshi's Island and Yoshi's Island: Super Mario Advance 3. As the name states, Hookbill the Koopa is fought here. Blue Yoshi starts in a long corridor with Boo Guys, and a Bucket hanging. After this corridor, the Yoshi has to use a bridge to across a lava pool, with a Hot Lips trying to harm Yoshi by spitting lava at him. The Yoshi also finds Koopa Troopas here, and it can use their shells to reach a Flower right above the lava. After the second Hot Lips, the Yoshi can use another shell to collect a Flower above the lava. The Yoshi also finds another bucket and a pipe spawning Boo Guys here. After the lava pool, the Yoshi needs to cross a long corridor, with Boo Guys trying to crush it with Maces. 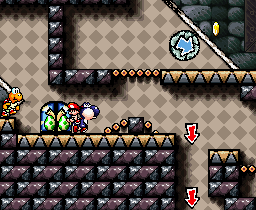 Yoshi must destroy large blocks with eggs here, allowing him to reach a Door. This door leads to a room, with Winged Clouds that form stairs when hit, and there are several Boo Guys opering maces. The Yoshi can also collect Red Coins here, as well as a Flower by passing through the flippers. Upon entering the door, the Yoshi finds an arrow wheel, which it must use to across a large area with Thorns and reach a locked door. It can also use this arrow wheel to reach a bonus area in the ceiling, where it must defeat two Puchipuchi L to earn a single Red Coin. To unlock the door, the Yoshi must hit a Winged Cloud in a narrow corridor using a Shell, thus making a stair appear. The Yoshi must then use this stair to reach another door. Here, the Yoshi must ground pound a Crate containing the key. Then, it must simply pass through the flippers to make its way back to the area with the locked door. After entering this door, the Yoshi needs to climb a tower while avoiding the Fishin' Lakitu that tries to steal Baby Mario with its hook. Once the Yoshi reaches the top, it must enter a Warp Pipe, leading to an area with several rectangular blocks, which can be destroyed by throwing eggs at them. There are two Flowers along these blocks. By destroying one of them, the Yoshi is able to use a trampoline to reach the red door leading to the boss. French Château du Koopa Géant. Giant Koopa's castle. The Potted Ghost's Castle Welcome To Monkey World! Naval Piranha's Castle GO! GO! MARIO!! Raphael The Raven's Castle Scary Skeleton Goonies! This page was last edited on April 10, 2019, at 12:56.